Following on from our Xperia arc six month review, we wanted to pen our thoughts on Sony Ericsson’s other flagship, the Xperia PLAY. The Xperia PLAY is rather an odd phone as it sits somewhat unique in the smartphone ecosystem. Much like the Nokia N-Gage, its objective was to marry a portable gaming system with day-to-day phone features. After all, who wants to carry two devices when one will do? These days the smartphone you buy, is not normally the same phone 6 or 12 months down the line. The eco-system is ever-changing and we especially expect this to be the case with the Xperia PLAY that will see the Playstation Suite introduced in 2012. However, after six months of solid use, we feel in a position to share the positives and negatives of the PLAY right now and outline these below. Ergonomics – If you believe what every manufacturer is trying to peddle these days, it’s that your phone should be as thin as a piece of paper. 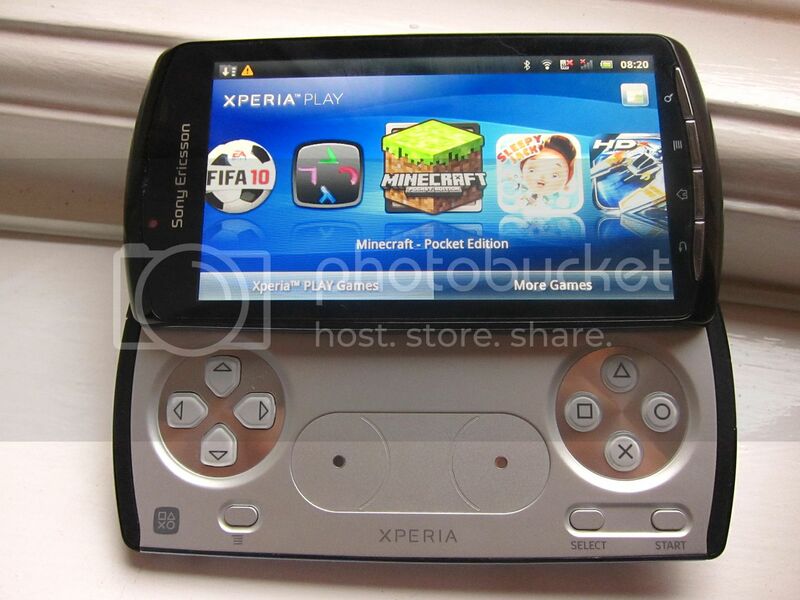 A lot of reviews criticised the Xperia PLAY for being chunky (16mm thick) and heavy (175g) when it launched. We think this is a little unfair, the phone has a slide-out joypad for goodness sake. Also, any thinner and it would just be plain uncomfortable to use. We think Sony Ericsson got the ergonomics right on this one, yes the design could be more attractive, but it feels right when you’re gaming (even more so than the original PSP we have lying around). Also, the weight, gives the unit a solid feel, but I wouldn’t say the PLAY is too heavy even then. Even though the design doesn’t set hearts racing, the white and orange colours of the Xperia PLAY do look fantastic. Slide-out joypad – Much like the slide-out mechanisms of other Xperia handsets, the joypad opens and closes with ease and feels sturdy at the same time. The d-pad and PS buttons have good feedback. The analogue pads are a nice idea too, although we feel that in most games they haven’t been implemented too well. Hopefully, this will improve over time as developers get used to the hardware. The L and R trigger buttons are also easy enough to reach, although much like the PSP, it can introduce cramp if you’re gaming for a while using the triggers. 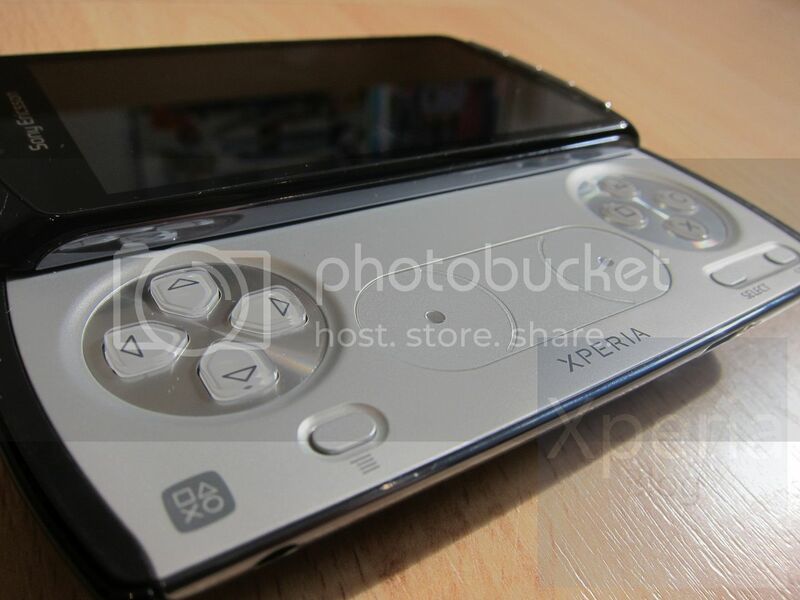 Price – Early adopters might be miffed, but the price of the Xperia PLAY has crashed in recent weeks. Whilst the handset cost around the £500 mark in the UK on launch at the end of March/early April, the price is now down to between £160-£200 in a number of retailers. The £500 launch price always looked like the wrong price to us, however at current levels, the PLAY represents a true bargain. It’s just a shame the company could not have priced the handset more competitively at launch to drive early sales. Growing games support – One commendable area in which Sony Ericsson is working tirelessly is driving Android developer support for the handset. Near enough every major Android game release has been exclusively released on the Xperia PLAY first. This includes everything from Minecraft and the soon-to-be launched FIFA 12. The company has also done well in supporting the independent game developers through the new developer program “Stand Out“. There are still many people who want to see a wider range of original PSOne classics to be released onto the Xperia PLAY. The good thing is that this is likely to ramp up early next year when the Playstation Suite is officially launched. Good all-rounder – The gaming side of the phone steals all the headlines, however putting that to one side and the Xperia PLAY is still a very competent Android smartphone. It houses the 1GHz Qualcomm Snapdragon Chipset with Adreno 205 graphics that comes with most of the 2011 Xperia line-up and proves itself to be perfectly adequate for most tasks. Couple this with good battery life from its 1500mAh battery and you have a perfectly good Android smartphone for day-to-day use. The in-ear speaker is loud and calls are conducted with ease. Emulator support – Obviously one of the great things about the handset is the sheer number of emulators that are available on Android. These include FPSE, N64oid, MAME4droid and others. The fact that keys can be mapped to the joypad controls is the icing on the cake. This gives you access to hundreds of games, as long as you legally own them of course! Stereo speakers – The Xperia PLAY has stereo speakers, which not only benefits games but other media content such as video. The speakers are placed at the bottom of the joypad, which means your fingers/hand have little chance of blocking the sound. The audio is loud enough for most situations when out and about. SE software support – Sony Ericsson continues to listen to customers and acting where necessary. Recent additions include the Android 2.3.4 update that enabled you to disable auto-brightness (a bugbear of many Xperia PLAY owners) as well as introducing 720p HD video recording. Like the rest of the Xperia line-up, the company continues to support its handsets with timely updates and we hope this continues once Android 4.0 (Ice Cream Sandwich) is released. Game download management – One of our biggest peeves over the Xperia PLAY is that there is no central game management utility. 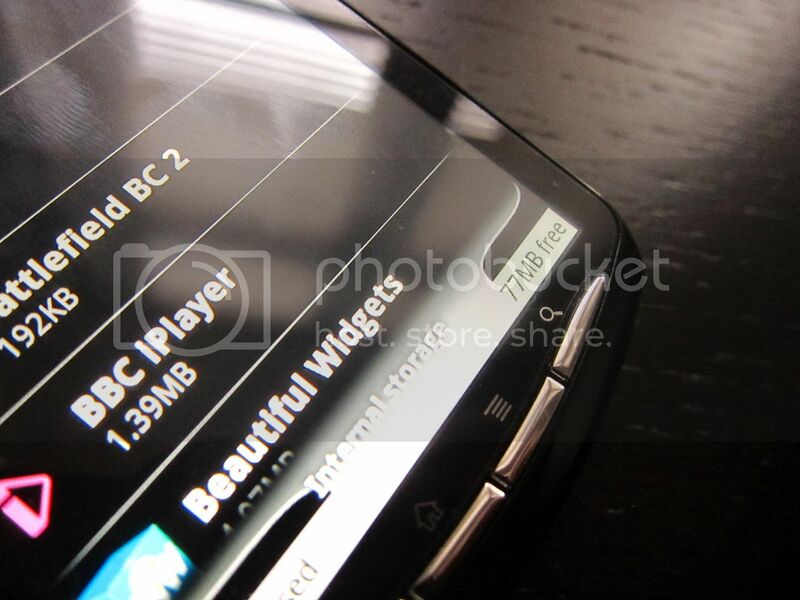 A normal Android handset will have the Android Market where you can download your apps and games. Whatever apps or games you buy stays with you on whichever Android handset you use. You simply log in with your details and voila you can download all of your content easily. Now with the Xperia PLAY, you have the game launcher but managing your content is a pain. First of all, you are directed to the game publishers mobile site to actually buy the app. This can be a frustrating experience as you jump through holes trying to purchase content. Then you are faced with another nightmare if anything goes wrong and you need to re-download content that you own. In an ideal world, all game content that you buy should be managed in one account ID. Whether it be a Gameloft, EA or PSOne classic game, the whole process of buying and managing paid-for content needs to be stream-lined and much improved. ROM size – Okay, whoever thought that they can get away with only 380MB of usable internal memory (from a 1GB ROM) on a gaming phone needs a rethink. There has been constant gripes from Xperia PLAY owners over seeing low memory warnings on their handset. Yes, you can move apps to the SD card, but this is not possible with all apps or games. You can make the phone install everything to the SD card using an ADB command, but this is past most users knowledge. Any users facing problems should download App 2 SD Pro that automatically checks if certain apps/games can be moved to the SD card. 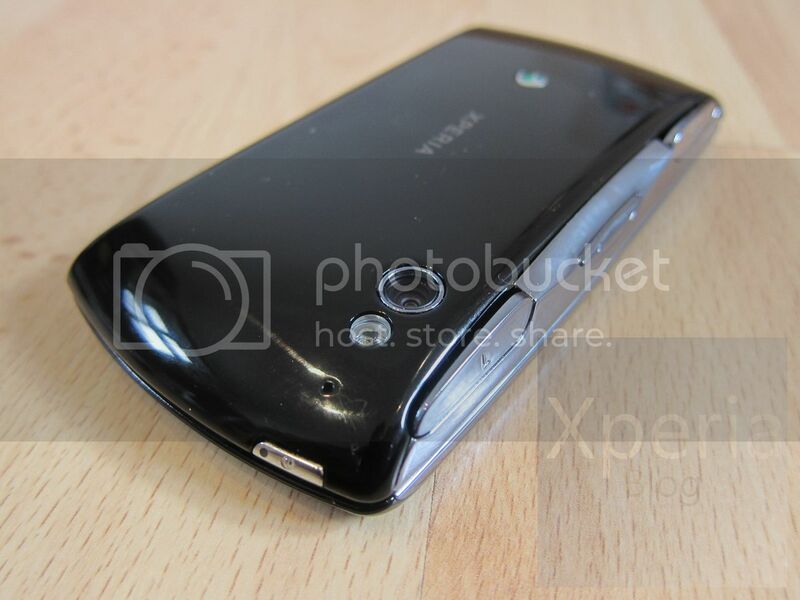 Camera – Not a deal-breaker for us, but considering that Sony Ericsson positioned this phone as one of their flagships we don’t understand why they couldn’t have included the same 8.1MP Exmor R camera sensor found in other handsets. It’s either one of two things, 1) space or 2) differentiation. We don’t think this was a space issue as given that the sensor could fit in very thin phones like the Xperia arc or Xperia ray with no problems, we doubt that they couldn’t fit it in the PLAY. In our view the company made a conscious decision not to cannibalise sales of its other line-up by not including a great camera. We imagine the cost played a part too, which is a shame. Small front hardware buttons – The Xperia PLAY is the only Xperia handset to have the full suite of four hardware buttons on the front of the handset (back, home, menu and search keys). We’re not entirely sure why this is the case, perhaps something to do with those Nexus rumours? Whatever the reason, the result is four small buttons crammed together which means you have to be careful not to press the wrong button. 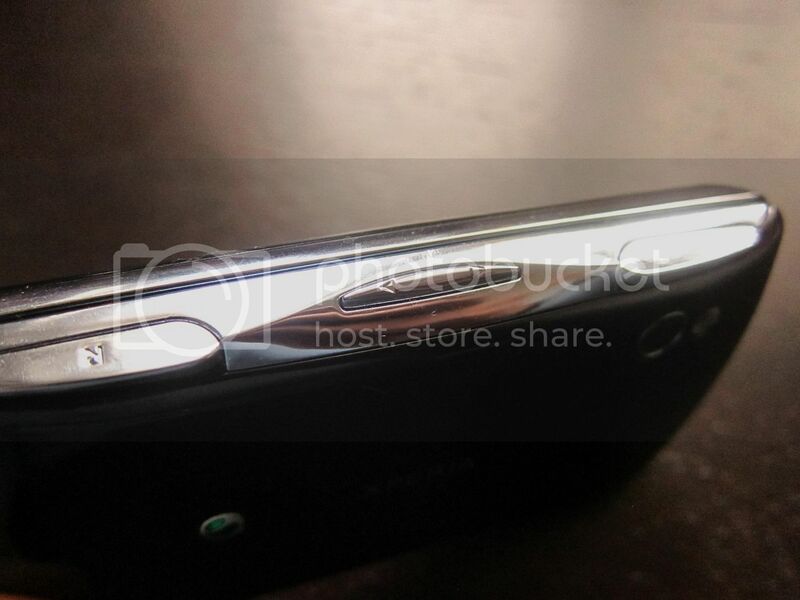 Tiny indicator light – The indicator light on the Xperia PLAY is very small. 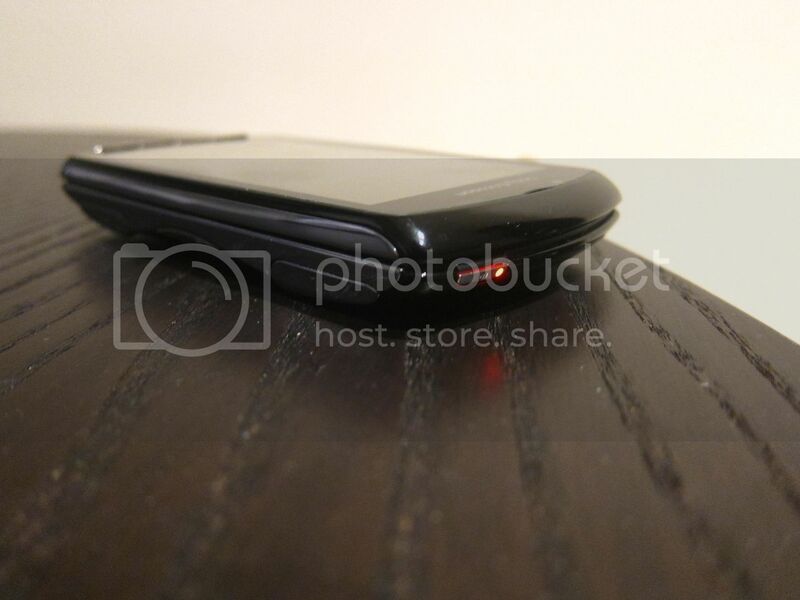 Not only is it small but it sits near enough the top of the handset but on the underside. The light is part of the power button that itself is angled downwards, this means that when on a desk you’ve got pretty much no chance of noticing it. 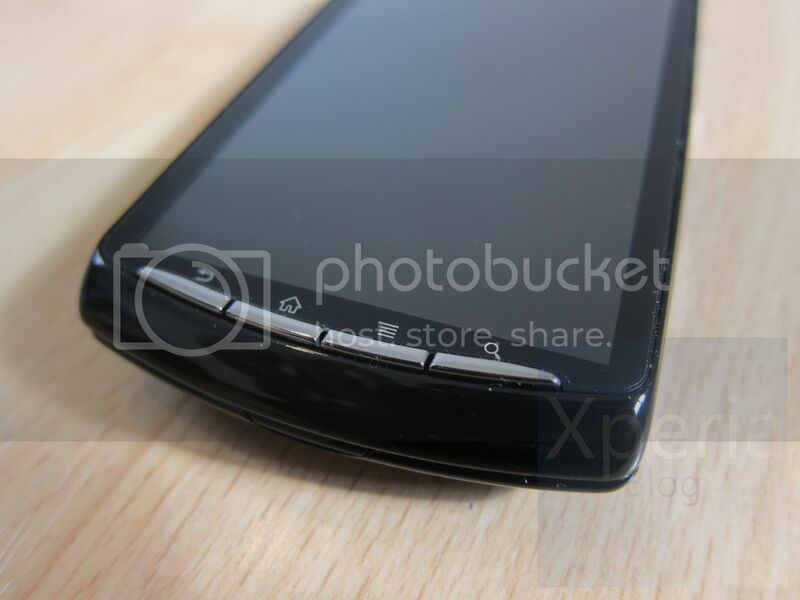 Volume buttons – The volume buttons for the Xperia PLAY are nestled into the middle of the right side of the phone. This means that when holding your handset it is not as easy to change volume as if the buttons were placed towards the top (like most other handsets). 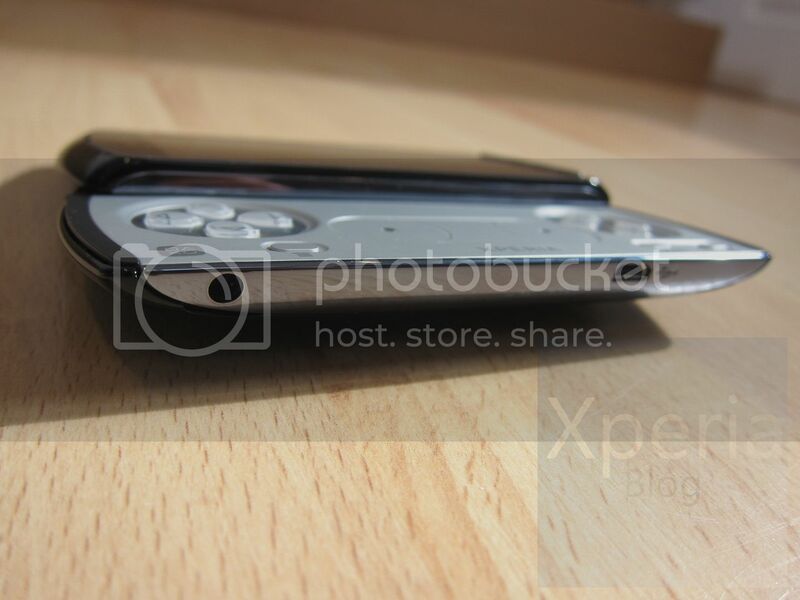 Also, because the Xperia PLAY is a slider, when pressing the volume buttons it can be difficult to get grip as the top part of the phone slides out. The keys are well placed when in gaming mode with the joypad slid out, but is not ideal if you’re using it as a phone. Headphone jack placement – Like the Xperia arc, the headphone jack is just on the wrong side of the phone. The 3.5mm jack should be on the top/bottom of the handset so that if listening to music, the wire won’t stick out at a 90 degree angle. We’re not going to beat SE up too much about this though as the placement works well if you are gaming with your headphones on. I suppose they couldn’t please everyone on this particular point. No HDMI – This one leaves us more perplexed than the omission of a better camera. The Xperia PLAY is a gaming device after all, so why did Sony Ericsson think that it wasn’t a good idea to stick a HDMI output in it. Being able to connect the handset to a big screen while gaming sounds like an obvious feature that many would have used. The fact that other handsets such as the Xperia arc and Xperia neo carry HDMI just rubs salt into the wounds. The additional cost of HDMI is the only reason we can think of in terms of its absence here. What really irks us is that Sony Ericsson obviously thought this feature was important enough for its dev units – so why not the wider public? The fact that its LiveDock accessory didn’t have any kind of TV out was another kick in the teeth. 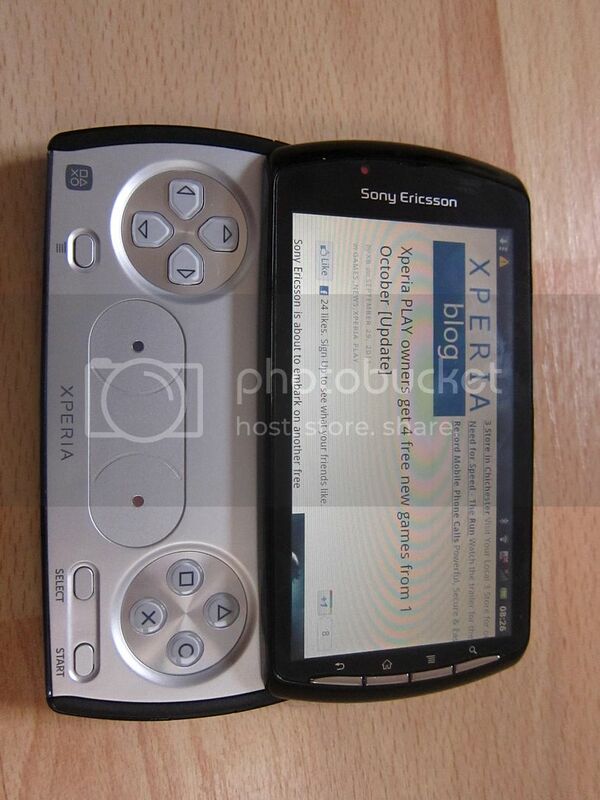 The Sony Ericsson Xperia PLAY is a gaming handset with so much potential. Yes, it doesn’t have the best specs out there in the Android world, but we’ve not found any games that have been limited by this. Plus, Sony Ericsson has been working hard to keep the software fresh as well as providing a string of Android exclusives. Next year, things will step up another notch with the arrival of the Playstation Suite, so there’s plenty to look forward to. There are a few issues though, namely the absence of a HDMI output, however our biggest day-to-day issue is the lack of any centralised game hub (something like Steam on the PC). Sony Ericsson needs to make it easier for users to both purchase and manage game content. It’s probably a big ask, but we’re sure it is losing sales given the clunky interface. Also, every different games publisher has its own standards that diminishes the overall experience. Despite this, if you are into your games, then the Xperia PLAY offers excellent value. The handset can be purchased for under £200 in the UK, which is a steal in our eyes. Especially as you get a smartphone that has sturdy build quality, great ergonomics and a long shelf-life in terms of software updates and gaming content (not forgetting all of the Android emulators that are around). 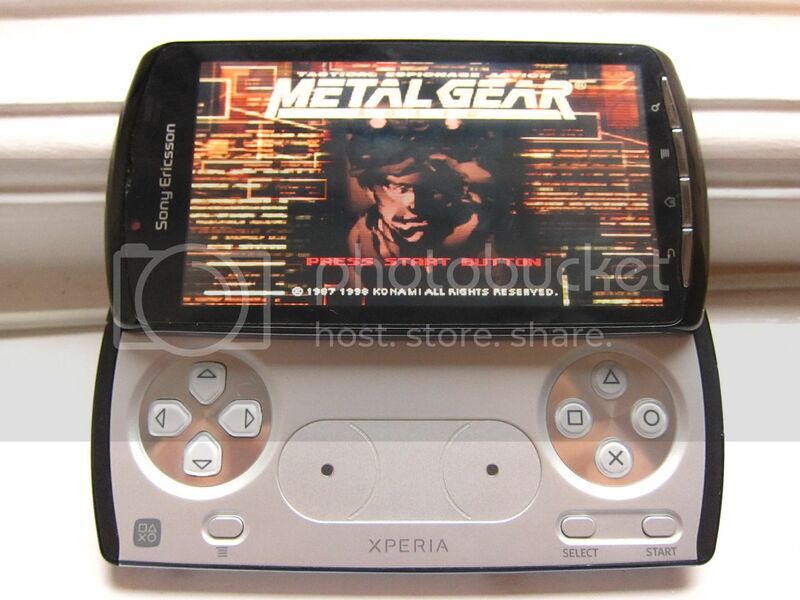 We really hope that sales of the handset have been strong enough to warrant an Xperia PLAY 2. With a few tweaks here and there and with all the lessons learned, we have every confidence a new iteration would be a killer gaming smartphone.